Storage Instruction: Keep in a dry cool place. 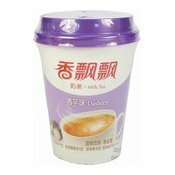 Ingredients: Milk Tea Powder: Vegetable Fat Powder (Glucose Syrup, Vegetable Oil, Sodium Caseinate, E471, E340(ii), E551), Sugar, Instant Black Tea Powder, Defatted Milk Powder, Lactalumin Powder, Food Additives (E341(iii)), Food Flavour. Coconut Jelly Bag: Water, Coconut, Food Additives (E330, E331(iii), E466, E421, Sugar, E327, Sorbic Acid). Simply enter your details below and we will send you an e-mail when “Milk Tea Drink Mix (Taro Dasheen) (香飄飄奶茶 (香芋))” is back in stock!